FIIG’s Bonds Service gives you direct access to high yield and investment grade bonds. At FIIG, we are committed to ensuring bonds are accessible for more investors. Historically, corporate bonds were restricted to $500,000 parcels. Now, hundreds of bonds, including high yielding and investment grade bonds are accessible to private investors with FIIG's Bonds Service. Our Bonds Service offers over 400+ bonds, from well-known names such as Qantas and Commonwealth Bank through to smaller companies such as G8 Education and StockCo. It also offers a mix of fixed, floating and inflation-linked bonds. 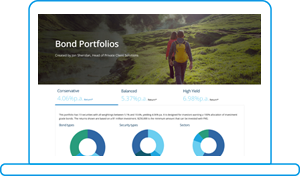 You can choose from sample portfolios or hand select the bonds to suit your individual investment needs. With the DirectBonds Service your clients can buy and sell bonds in parcels from $10,000 with a minimum portfolio balance of $250,000. When you buy bonds in the over-the-counter (OTC) market, you are required to hold them in the safe keeping of a licensed custodian until they mature or you decide to sell them. CHESS, a company owned by the ASX, is one example of a custodial service provider for financial products such as shares, warrants and units in trusts. However, CHESS does not cater for OTC bonds. Licensed custodial service providers, such as FIIG, hold an electronic record of an investor’s beneficial ownership of a bond. They also provide a range of services including account administration, transaction settlements and reporting. Find out more about FIIG’s Custodial Service.